Learning to swim can be quite an enjoyable journey for a toddler or a young child, however, it can also very well cause a lot of stress which could turn into an unnecessary water phobia in later years. There are many aspects in and around the pool which can be stressful for our young ones. For example, going to a pool with cold water, that is not fun:), taking a cold shower before going to the pool, is that fun?, visiting a pool where every time a toddler is taken out of the water, the air is freezing, how much fun is that?, having an over tightened and uncomfortable swim suit, definitely not fun. This is a guest post by Kristen Swope, a Fremont, California based freelance writer who lives with her husband John and five year old daughter Isabel in a house with a swimming pool. Comfort and protection are our most important considerations when dressing up a toddler or a small child for a swim session. My daughter Isabel is five, but quite small for her age, so we usually get her swimsuits in the toddler catalogues or department store section. In the five years we have spent picking out swimming clothes and gear for her, we’ve learned to narrow down the choices with five most important things to consider, which I’d like to share with you. As previously mentioned, standard toddler or kiddie sizes may not be applicable if children are either big or small for their age. Both height and different body parts should be measured prior to purchasing a swimsuit. Before every shopping trip, I make Isabel stand barefoot against a wall, and mark the wall behind the top of her head with a pencil. At her age, a few centimeters of growth can spell a world of difference between an enjoyable time at the swimming pool because of a bathing suit that fits properly, and one that chafes her and makes her irritable. To measure her chest, I have her raise her arms above her head and use a tape measure on the fullest part of her chest area and around her shoulder blades. Her entire torso is measured by running the tape measure from the nape at the center of her shoulders, around her crotch, and back up in front towards the neck. I also measure her waist and hip areas but make sure not to gauge size over clothes for a snug fit. However, when Isabel was still at the age when she wore diapers all the time, I was advised to measure her hip area while she had her disposable nappy on, as this influences the type of swimsuit I would be getting for her. I advise this for toddlers still in the process of potty training, as well. Swim sessions, no matter how enjoyable, can make a child grumpy if in an ill-fitting swimsuit. Too-tight shoulder straps, waistbands, and crotches can cause rashes and ugly red marks on children’s sensitive skin. You may be drawn to cute prints and designs on a swimsuit, but learn to look at the tags first to see what the suit is made of. Lycra combined with cotton is considered one of the most comfortable fabrics for swimsuits because they are the most stretchy, glide smoothly in water, and the cotton parts allow the skin to breathe. Think about other bathing suit considerations for girl toddlers: are the straps adjustable, or can they be tied halter-style around the neck? Halter ties are harder to un-knot, so straps might be a better option. Are they more comfy in one piece or two piece suits? For boy toddlers, consider buying board shorts or trunks in several lengths for different coverage and protection for activities in both pools and beaches, and to have them change into something fresh in-between drying time of previously worn swimsuits. Bear in mind that some toddlers in the process of potty training cannot express when they need to go to the bathroom, especially once they are in the pool. To avoid embarrassing accidents, consider getting swimsuits with buttons or poppers at the crotch area for easier diaper changing. Toddler girls can do with two piece swimsuits because a one piece means harder maneuvering. When Isabel was at potty training age, we got her more swimsuit bottoms to go with a few tops, so we always have a fresh supply of them whenever we need to change her diaper (now that she’s totally toilet trained, she prefers one piece suits). Boy toddlers can have a number of comfortable swim trunks or shorts available every swimming session to go with every diaper change. There are now toddler swimsuits which offer sun protection in pretty much the same way a sun block does, as well as ones that have buoyant panels stitched in to add flotation security for a child while in the swimming pool. They are pricier than regular swimsuits for toddlers, but the extra safety and protection they offer do make up for it. 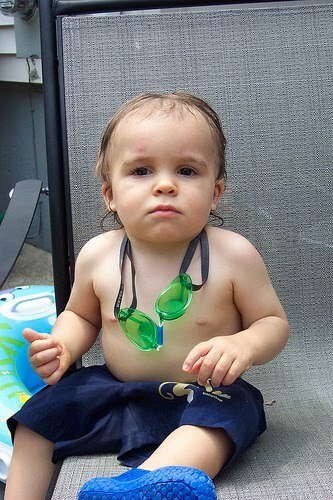 Sun protection swimsuits work to provide maximum coverage on a toddler’s body, especially the single piece ones. These typically come with SPF 50 protection which is perfect at battling sunburns. For the rest of the exposed parts of the child such as the legs, arms, face, neck, and shoulders, keep slathering sunblock to prevent burns, and invest in a sun hat as well. Last but not least, consider swimsuit price ranges and your budget. We have a swimming pool at home so it means regular swim sessions for my daughter Isabel, but it doesn’t necessarily dictate that she keeps a wardrobe full of swimsuits for each day. Remember that toddlers can outgrow clothes pretty quickly, so investing in a couple of good sturdy pieces (around four or five) is a good idea. Mixing and matching pieces especially for little girls is another great way to keep to your swimsuit budget, and as previously mentioned, can make diaper changing a cinch. When going swimsuit shopping for your toddler, it is nice to have them choose ones they’d like to wear so that they can practice decision making at an early age. Just make sure to narrow down the choices to a few select pieces so they don’t end up picking ones that are astronomically priced! great advice on I do think these UV suits are brilliant and would highly recommend them to any parents of toddlers who will be taking them to the beach. This will help mucho as we're introducing our baby to the water for the first time. Thanks! Thanks for the great info! I have a line of women's swimwear and am planning on expanding to children's swim as well. I will be keeping all of this in mind as I make my new creations. Thanks again! Really useful article thanks, but you didn't mention safety considerations of one vs. two piece costumes. I was told to always go for a one-piece as it is much easier to grab the child in the event of an emergency. Two piece suits are more likely to come off if you grab them. @Jess: thanks for the comment. You make a very good point about the safety which is even more important with toddlers. Swimwear for young people is really quite easy because all you have to worry about is "does it fit". This also makes it more enjoyable. Thanks for the post. Great article about the various considerations when buying small childrens swimweat. Other than the safety point mentioned by Jess, it is also important to consider the temperature of the swimming environment. For example if in a hydrotherapy pool with high temperature, these suits can cause over-heating. Common sense really, but something that should be thought about.